Some of the best British spy thriller writers were former intelligence officers, such as Ian Fleming, Graham Greene, John le Carre and Somerset Maugham. Now Frederick Forsyth, the author of The Day of the Jackal and other great thrillers, may at last reveal that he is a member of that club. Gordon Rayner at the British newspaper the Telegraph reports on this possible revelation in Frederick Forsyth's new book, The Outsider: My Life in Intrigue. He has long been lauded for the uncanny realism of his spy thrillers, and now Frederick Forsyth is set to reveal the secret of his insider knowledge: he was himself an agent for MI6. Fans of the 76-year-old author had suspected he may have had brushes with the Secret Intelligence Service, as MI6 is formally known, and Forsyth is expected to confirm they were right when his autobiography is published in September. As a journalist for the BBC and Reuters, Forsyth spent time based in Communist East Germany and in Africa, where he became close to key figures including Odumegwu Ojukwu, leader of the Nigerian breakaway state of Biafra. He has admitted in the past that he often draws on his real-life experiences for the plots and action in his books; his experience of reporting on an attempt to assassinate the French president Charles de Gaulle gave him the idea for his first novel, The Day of the Jackal. He has also admitted having friends in MI6. In his newspaper column Forsyth has referred to “taking lunch with a senior officer of from the Secret Intelligence Service” though he did not explain how they knew each other and he has never gone as far as revealing that he was recruited by them. The title of his new book, The Outsider: My Life In Intrigue, provides a huge hint that he will use it to blow his own cover as a former spy, and it has become an open secret in the publishing world that he is about to do just that. 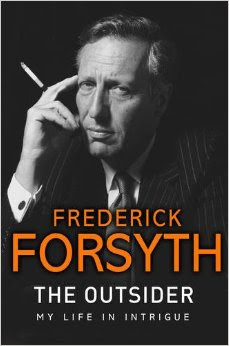 ... As a former RAF jet fighter pilot who spoke German and French like a local, and whose job took him behind the Iron Curtain and behind enemy lines in Africa, Forsyth would have been a natural choice for an approach by MI6. He also lived like James Bond even without the help of Britain’s overseas spying agency.